A nasty, little virus knocked on our door a few days ago and my younger son was hit rather hard. After a couple days of not eating much, he requested a smoothie last night (as well as last week’s bread…couldn’t pull that one off in time!). I had one more mango on hand–his favorite–so I used that as a starting point for a Vitamin C-packed treat. Usually, I add ice and a frozen banana to make our smoothies thick and creamy. 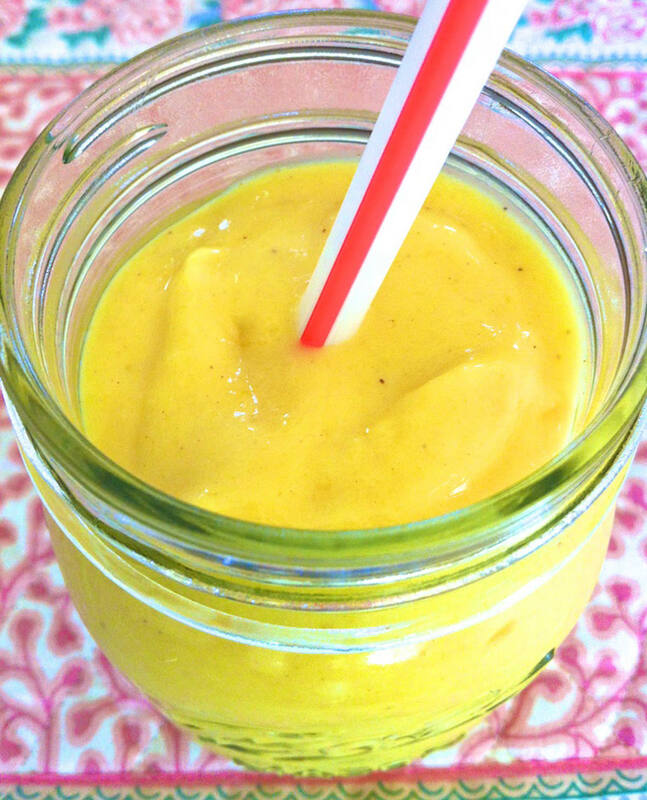 This time, the velvety mango along with frozen peaches did the trick. It was thick, sweet, healthy, and extremely satisfying. (And it perked up the patient!) I will definitely make this one again. Place all ingredients in blender, cover, and puree until smooth. Add a little extra orange juice if you prefer a thinner smoothie. I find when I use frozen fruit, it is not quite as sweet as fresh. Depending on what you are using and how sweet you like your smoothie, you can add the agave or honey to suit your taste. yummm, this will be breakfast tomorrow before yoga. LOVE mango! Pingback: This Month’s Healthy Bite: What Are Your Favorite Memorial Day Recipes? I’m so delighted I found your site. I made this and absolutely love it. Cheers for an incredible recipe and an all around enjoyable blog. Keep up the awesome work! It was so yummy — like having dessert. I’ll be making this one many times. Keeper. Hi Kathy, Sounds like a good buy! I think I’d try pineapple juice for the tropical notes and complementary flavor. If you have canned coconut milk you could try mixing in some of that. You could also add a frozen banana for the sweetness and creaminess it provides, and then add water to achieve your preferred consistency. Also, if you like baked oatmeal I have a great peach version that works well with frozen peaches!